The interface is (of course) Microsoft Excel. However, the interface file is opened "read-only" since all of the data is stored in a back end multi-user Microsoft Access database. 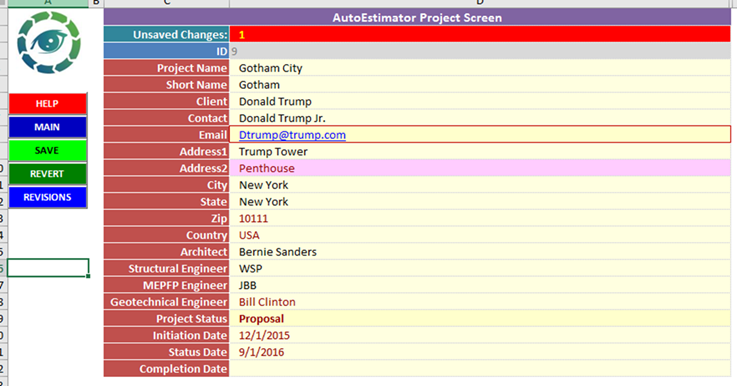 This allows multiple users to simultaneously work with the AutoEstimator. The Main Screen lists all of the projects that have been saved. The CLONE command allows the user to clone an existing project to create a new project, with the existing project as the starting point. The BACKUP DB command backs up the Microsoft Access database. This command also executes whenever anyone opens the file. 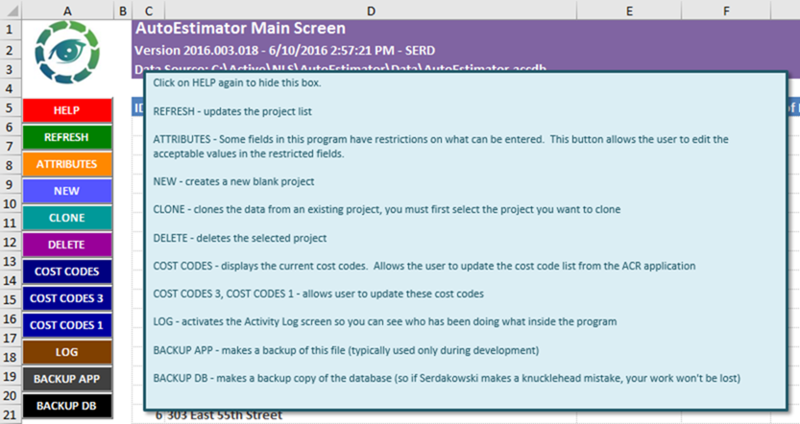 The PROJECT Screen is where the user enters basic project data. 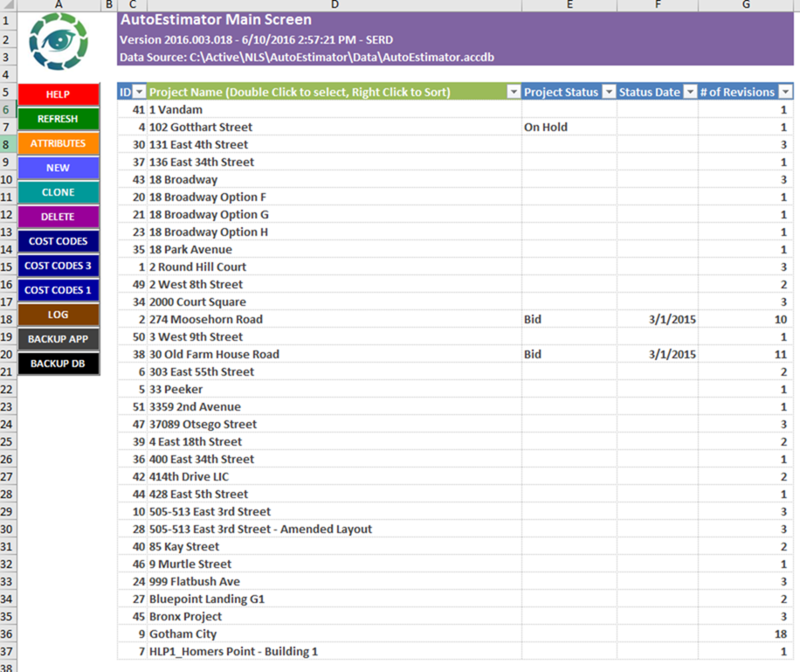 As with all AutoSoft tools, pale yellow cells indicate places where data entry is allowed. Unsaved changes are pink until the user clicks the green SAVE button. The REVISIONS screen tracks the unlimited number of Revisions that can be managed for a single project. Note the CLONE button which allows one to use one revision as the starting point for another. 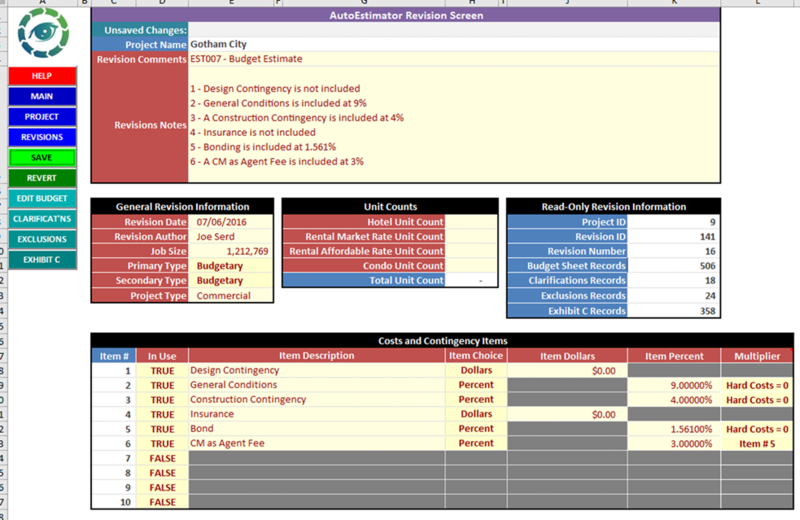 Note the "Budget Sheet", "Clarifications", "Exclusions" and "Exhibit C" columns, which tell the user how many records there are in each of these categories. Double - clicking on a Revision brings you to this screen, where basic information for the Revision is entered. The EDIT BUDGET screen is where most of the "heavy lifting" is performed. Here the user builds up the estimate one cost code at a time. There are many different features on this screen that facilitate the estimation process, far too many to cover in this overview. Call AutoSoft for a demo of the many features, which can be done via Webex, screen sharing and the telephone.